At its second meeting in Addis Ababa (16 September 2013) the Steering Committee of the CRP Dryland Systems took the decision to elevate the issues of gender and youth so that they are directly addressed as an Intermediate Development Outcome for the program. 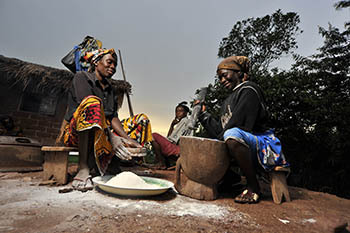 The decision was actively promoted and supported by Harry Palmier, representing GFAR on the Steering Committee and Jennie Dey De Pryck, GFAR’s Senior Gender Adviser to the Gender in Agriculture Partnership, who has been providing expert advice to the development of the gender strategy for this CGIAR Research Program. Following this decision, gender staff and partners of the Dryland Systems CRP are now developing a proactive strategy for putting this into action, which was discussed during the CRP Regional Implementation & Partnerships workshop in Lilongwe Malawi (17-22 September). Rajita Majumdar, Communications Specialist at ICARDA reports on this unique move among the CRPs to combine gender and youth in an integrated strategy.